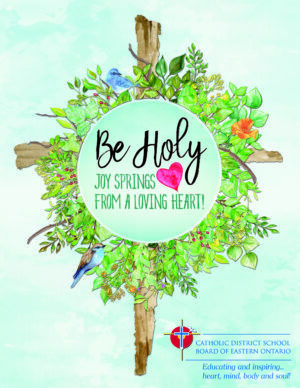 The new CDSBEO Board Theme Be Holy – Joy Springs from a Loving Heart! is inspired once again by scripture; by the Saints and by the Holy Father Pope Francis. The theme, which will be implemented over the next three years, was formally presented to the Board of Trustees at the August 29th meeting. Students from the choir at St. Joseph’s Catholic Secondary School in Cornwall began the presentation by singing a song written to accompany the theme entitled Be Holy. The song will be incorporated into celebrations, liturgies, and masses throughout the CDSBEO. Theresa Lalonde Pankow, Principal of Religious and Family Life Education, provided an outline of the new theme, how it was inspired, and how it will be lived out throughout schools. “We have been blessed in our board to have wonderfully engaging themes that have allowed us to access, unpack and bring to life our board’s vision: Inspired by the teachings of Jesus Christ, we transform the world with justice and peace through Catholic education,” began Mrs. Lalonde Pankow. Each year of the theme will be a balance of contemplation and action. Constant reflection on God’s presence will be a focus, which will be counter balanced by recognition of the needs of others. Schools have been provided with resources to help bring the new theme to life in CDSBEO classrooms and in student life. It will also be a focus to inspire and inform social justice initiatives and acts of kindness throughout the Board. The Board will be providing professional development days for educators, as well as implementing a new “CDSBEO Week” to help engage students in the new theme and its messages.